At Heidelberg Dental Care our philosophy is simple. We aim to provide the dental care we would expect for our families and friends. For more detailed information about trauma and treatment a new web site has been setup for dentists by the dental trauma experts in Copenhagen. NOTE: Dentists may refer to this guide for treatment pathways as dental trauma in Australia is luckly less common. Find the tooth and pick it up by the crown (the part of the tooth that's seen in the mouth, not the root which holds the tooth into bone. If the tooth is clean, place it straight back in its socket (hole). If the tooth is dirty, wash it for a few seconds in water or milk and place it back in its socket. If you can't replace the tooth, place it in a glass of milk. Get your child to the dentist immediately with the tooth. Wash any wound with clean running water. Stop bleeding by placing pressure to the injured area with gauze or cotton wool for 5 minutes. See your dentist. Lost baby teeth are usually not replaced because this may cause damage to the adult teeth. Occasionally the dentist is able to "glue" the tooth fragment back into place. Find the tooth fragment and place it into water. "Each day in Australia some 5000 children seek medical attention, 170 are hospitalised and about 350 children die annually, the majority from preventable accidents. Apart from the human suffering the direct medical cost of children's accidents in Australia is $250 million annually, the indirect costs are three fold taking the estimated cost of child accidents to the community to a staggering $1 billion a year." The Child Accident Prevention Foundation of Australia - an independent non profit organisation dedicated to preventing unintentional death and injury of children. During the "growing up" years increased activity makes the likelihood of tooth damage due to falls and knocks greater. You can't always prevent mishaps, but makes sure you see your dentist or doctor immediately for advice. Summer time is supposed to be the most injury prone time of year. 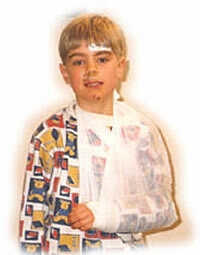 Watch children and look at ways of preventing injuries. Look for playgrounds with a safe surface. Wood chips, sand or shredded rubber are good. Avoid asphalt and concrete. Keep chairs and other furniture away from windows. Use safety gates to keep toddlers away from stairs. Use safety belts to restrain your child in shopping carts. Stay close to the cart while you shop. According to The Children's Hospital Westmead: A quarter of all 15 year olds have had some type of injury to their front teeth - not all accidents result in complete loss of the tooth but this is still a very high number of injuries.